a reflex action of the toes, normal during infancy but abnormal after 12 to 18 months of age; after locomotion begins, it is indicative of abnormalities in the motor control pathways leading from the cerebral cortex and is widely used as a diagnostic aid in disorders of the central nervous system. It is elicited by a firm stimulus (usually scraping) on the sole of the foot, which results in dorsiflexion of the great toe and fanning of the smaller toes. Normally such a stimulus causes all the toes to bend downward. Normal and Babinski reflexes. A, Line of stimulation: Outer sole, heel to little toe. 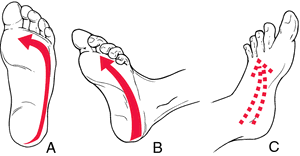 B, Plantar (normal) reflex. Toes curl inward. C, Positive Babinski reflex (always abnormal). Great toe bends upward; smaller toes fan outward. An extension of the great toe, sometimes with fanning of the other toes, in response to stroking of the sole of the foot. It is a normal reflex in infants, but it is usually associated with a disturbance of the pyramidal tract in children and adults. Also called Babinski sign, Babinski's sign. a reflex action of the toes, indicative of abnormalities in the motor control pathways leading from the cerebral cortex. It is elicited in dogs and cats by an upward stroking of the metacarpal or metatarsal bones. A normal reaction is slight flexion of the toes. In a positive sign, the toes extend; seen with upper motor neuron lesions. Called also Babinski sign. That is why we recommend maintaining the term Babinski sign as described originally and using Babinski reflex for "the great toe sign. Results: The Babinski reflex had been observed much earlier than 1896, when Babinski referred to his finding for the first time.